Dessert Crepes – Caribbean Style (with a Butter Rum Sauce)! Every Sunday my friend Carole makes crepes for her family and friends. I’ve been thinking about all the different things one could fill these tasty pancakes with, so i decided to make use of the local fruit. To make the crepes I used a 10 inch omelet pan to make the crepes. Note: It would be a mistake to eat these crepes without the butter rum sauce flavored with your own local dark rum (It has to be dark so my apologies to my French island friends). Combine all the ingredients in the jar of a blender, and process for one minute. Scrape down the sides of the blender with a rubber spatula and blend for another 15 seconds, until smooth. Set the batter batter aside to rest for an hour. Preheat the omelet pan over a medium heat, lightly oil or butter the pan. With one hand pour 1/4 cup of batter into the hot pan. Using the other hand at the same time lift the pan above the heat and swirl the batter so it covers the bottom of the pan in a very thin layer. You have to work quickly before the batter cooks too much to swirl. Return the pan to the heat, cooking until the crepe bottom has browned. Carefully flip the pancake with a spatula to brown the other side. Remove from the pan and stack on a waiting heat proof plate. Repeat until the batter is finished. I served the crepes 2 ways…. the first was with mango, Butter Rum Sauce and a dusting of confectioner’s sugar. 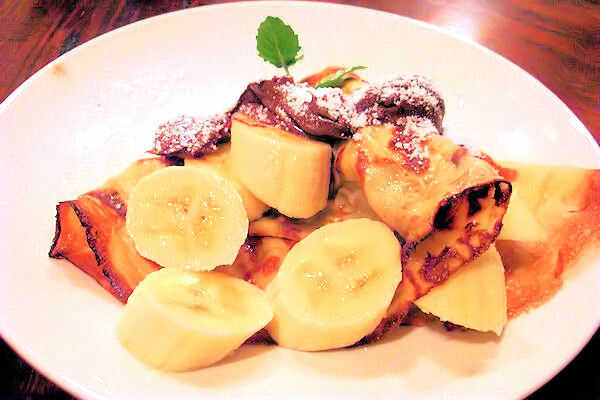 The second was Banana and Nutella. In a small heavy saucepan using medium heat, stir the brown sugar and the heavy cream until the sugar has melted. Pour in the rum and simmer, stirring until the sauce is reduced and has become smooth and thick. Gradually stir in the butter until it has melted and the sauce is emulsified.